Considering This Is It was pulled from some 80+ hours of rehearsal footage filmed primarily for Michael Jackson’s private library, the movie is a surprisingly entertaining look at Michael mere hours before his death. In addition to offering a close-up look at the King of Pop’s creative process, it also serves as pretty solid evidence somebody killed Michael Jackson. Why make this movie? Even some squabbling members of the Jackson clan say Michael never would’ve wanted people to see him in raw rehearsal footage. But that’s a narrow-minded view of what This Is It represents. It was only this past spring when “Wacko Jacko,” as dubbed by some in the London press, announced his “final” gigs at London’s O2 arena. There were to be 10 shows but, in true King of Pop fashion, in what seemed like only the blink of an eye that stand went from 10 shows to an eye-popping 50. Yes, 50 gigs for a 50-year-old pop superstar. Shortly thereafter the rumor mongering began. In May, the first four dates were pushed back in order to provide a few more days of rehearsal time. Instead of opening on July 8, the opening moved to July 13. Then the first four shows were rescheduled for March 2010. Of course, Michael had reneged on obligations to perform before; the lawsuits made headlines. Could this be another case of “all hype and no show” for a man who spent the previous decade essentially roaming the planet looking for a new home after he lost his taste for Neverland Ranch in the aftermath of child molestation scandals? To be clear, This Is It is strictly based on the rehearsals leading up to what was to be that record-breaking London series, which in turn was intended to serve as the launch of a full-blown world tour. No mention of Michael’s death is made in the movie, not even in the final frames, which display the name Michael Jackson; the logical expectation is to then see 1958-2009. But no, the dates never appear. Instead, it’s a message of love from Michael. So. Did Michael Jackson really have a show this time? Yes. Most definitely. This Is It is being released under extremely unusual — and unfortunate — circumstances. The majority of the gigs should’ve already been performed and a live DVD should be getting prepped for the holidays. That can’t happen and, instead, This Is It offers some degree of name-clearing regarding Michael’s comeback aspirations. At least the chatter of a “vaporware” show can now be fully silenced. Focusing squarely on the positive, This Is It starts off with a note dedicated to the fans and a Chorus Line -like vibe, with teary-eyed and excited dancers expressing their extreme gratitude for Michael and the opportunity they’d been given. One lad even flew all the way from Australia to Los Angeles as soon as he heard tryouts were taking place. The movie presents Michael as lucid, aware and sensitive. He also displays significant vitality in his ability to moonwalk, strut and coo like in the days of yore. Of course, on more than one occasion he also says he’s holding back a bit to conserve his throat during rehearsals. Through it all, though, he’s totally in the moment (at least during the 112 minutes presented out of the 4,800+ minutes recorded). As for the show itself, the final production would’ve been spectacular, but even that is based strictly on raw rehearsal footage, some nifty staging pre-visualization animation, footage filmed for the stage’s giant screen backdrop, and the presentation of costume designs. The show never made it to a full dress rehearsal. Nonetheless, it’s still thrilling to see Michael work and the set list here is full of crowd pleasers. Getting the most technical, behind-the-scenes footage is Thriller, which was to have incorporated a 3D screen presentation, and They Don’t Care About Us, in which, thanks to a green screen and computer magic, 11 dancers turn into a screen army of 1,100. Smooth Criminal also gets the deluxe treatment with Michael being embedded into a Humphrey Bogart/Edward G. Robinson gangster flick. Other standouts include The Way You Make Me Feel, Beat It, I Just Can’t Stop Loving You, Black or White, and Billie Jean. I’ll Be There is accompanied by vintage Jackson 5 footage. To the movie’s credit, This Is It doesn’t completely and utterly white-wash things. Heck, there’s even something akin to a Spinal Tap moment. At one point the music producer, Michael Bearden, comments on how he loves it when his collaborators are “hands on” and involved in the work. Michael Jackson, he asserts, is most definitely hands on and he loves that fact. He loves it! Jacko chuckles, enjoying the booty reference and the situation is defused. There are several instances of good humor, intentional or otherwise, among this band of brothers and sisters. Particularly when grandiose comments like “the dancers are an extension of The Man ” are spoken with pure sincerity. Then there are the weird comments Michael makes about how he feels like a fist is being jammed into his inner ear. 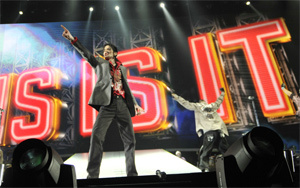 This Is It also presents Michael Jackson as something like a real-life magician. At one point, director Kenny Ortega asks Michael how he’ll know when his visual cue hits if he has his back to the screen. “I’ve got to feel it,” Michael says. In the context of all that’s going on and what Michael represents artistically, that’s a genuine goosebump moment.